The Health Resource Network, Inc., official sponsor of National Stress Awareness Month, announces the release of two new Kindle Books in April to promote awareness about the causes of human anger and the nature of true forgiveness. This year marks the 21st year that April has been designated National Stress Awareness Month (http://stressawarenessmonth.com) . Sponsored annually by The Health Resource Network, Inc. (HRN), a non-profit health education organization, Stress Awareness Month is a national, cooperative effort to inform people about the dangers of stress, successful coping strategies, and harmful misconceptions about stress that are prevalent in our society. “Even though we’ve learned a lot about stress,” says Dr. Morton C. Orman, M.D., Founder and Director of HRN, “we still have a long way to go.” According to Dr. Orman, there are many new ways of understanding and dealing with stress that are not well known but could help millions of Americans eliminate their suffering. This year, Dr. Orman will be focusing on the problem of increasing anger in our society. During the month of April, he will be making available (at no cost) two of his recently published self-help guides on how to reduce anger and irritability as well as how to truly forgive. 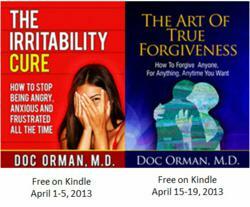 To personally support Stress Awareness Month this April, Dr. Orman will be offering his recently published Kindle book “The Irritability Cure” for download on Amazon.com from April 1-5. His second Kindle book “The Art Of True Forgiveness” will be available from April 15-19. For more details about National Stress Awareness Month 2013, please visit http://stressawarenessmonth.com . The Health Resource Network, Inc. (HRN) is a small, privately-owned, non-profit health education corporation (501C3), founded in Baltimore, Maryland in 1982.